If you take the road down the west side of the Nochty, from the Bridge over the Nochty to Lost farm there are a number of ruined steadings along the track. In the trees on the left are the ruins of Blairnamuck farm house. Further along the track on the right are the remains of Corriebreck. Corriebreck. 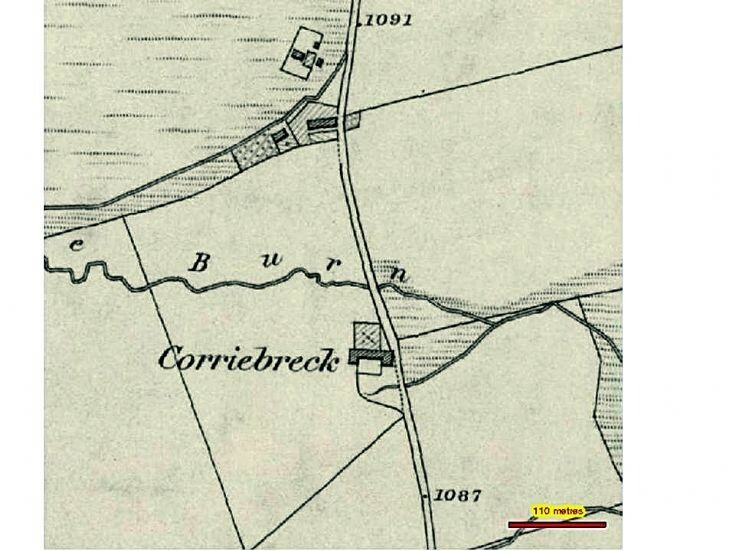 Farm named from Coire breac, " speckled corrie." The follwing are snippets from Corriebreck's historical past. William Forbes of Corriebreck married Jean Michie c 1710-1790 eldest of the 'Five Maidens of Rippachie', daughters of James Michie of Rippachie (died 1752) and Elizabeth Copland. According to the Red Book in the OIO Library one of their sons was James Forbes of Seaton. James Forbes (1735-1829) was the son of William Forbes of Corriebreck and his wife Jane Michie, and grandson of William Forbes of Belnabodach. Very little has been published about his life. From the records deposited here and other collections in the University (see 'Related Material' field) it is known that he had business interests in London, and that he was one of the proprietors of the Aberdeenshire Canal. The main references to him in A. and H. Tayler's 'The House of Forbes' (Third Spalding Club, 1937; pages 368381) concern his purchase of the estate of Newe from his bankrupt relative Major John Forbes, 9th Laird of Newe, which he resold, for a considerable profit, to 'Bombay Jock' Forbes, founder of the Bombay mercantile business, Forbes and Co. Later, c. 1782, he purchased Seaton Estate in Old Aberdeen, and settled here with his wife, Margaret Gordon, daughter of Rear Admiral William Gordon of Banff. Their only surviving child and heiress, Elizabeth Forbes, married Lord James Hay (17881862), second son of George, 7th Marquis of Tweeddale (17531804), in 1813, and they subsequently lived at Seaton with her father, who died in 1829, aged ninety-two. Captain James Malcolmson, of General Wemyss' Regiment of Foot, was married to Miss Barbara Grant, daughter of Captain Grant, Rippachie, at Tarmore, on the 8th of January, 1800, and Miss Mary Grant, Rippachie, died at Muckerach, near Granton, in her 77th year, on 26th Aug. 1838.
" James Grant, of Corriebreck, his wife, John and George Cirants, his sons, and Anna and Elizabeth Grants, his daughters."